A very cool conspiracy thriller movie with both mystery and action around every corner. 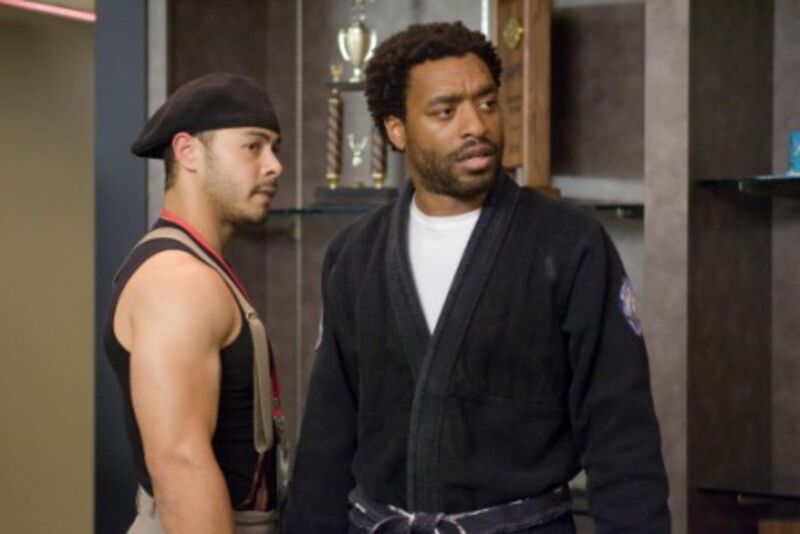 A well-written and intense movie about a jiu-jitsu teacher who gets caught in the middle of two situations where he meets new characters and is brought into a world he is unfamiliar with. mike terry (chiwetel ejiofor), is a noble man who lives a simple life until he is seduced by hollywood producers who want more from him then they are letting him know. suddenly mike is at the heart of a mystery that involves black mail and suicide and championship fighthing. there are lots of secrets and reveals here, and the dialogue by director david mamet, is in top form. even time allen is great, in an unexpected serious role. it’s a great movie loaded up with smart twists and ideas. 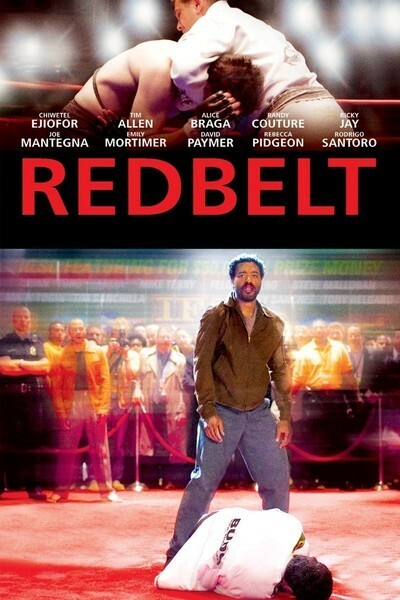 Redbelt is a martial arts conspiracy movie. those are two genres that don’t often get mixed together. on the one hand, this is a samurai film about honor and integrity with plenty of fights. on the other hand, it’s a typical david mamet movie, which means a seedy underworld, corruption film with shady characters who you can’t trust and who are up to no good. nobody does that genre better than mamet. he’s got a trio of excellent films in the genre with Redbelt being one of them. the others are the spanish prisoner (mamet’s best), and heist (the weakest of the three, but still a good film.) Redbelt fits right in between them, as a pretty cool movie with a lot going on. the film starts out with mike terry running a class at his accademy dojo. he teaches a brazilian form of karate called jiu-jitsu. the movie opens with drum beats that sound ancient and symbolic, and a fight that has mike shouting out advice and commands equally. the two men fighting participate in something that starts out as a “take him to court,” kind of pose that becomes an all out brawl. the fighting is fun, but it’s mike’s words of wisdom, such as “you know the escape,” that are the really neat thing about this scene. it’s a stormy night outside and the students of the accademy clear out leaving just a small handful of characters around. these are the people who work there. it’s mike, his assistant, snowflake, his wife, sonja terry, and his student who is about to become a teacher, named joe. this guy, joe, is a police officer and he puts on his gun and is ready to leave when mike calls him over to mess around a little more. joe takes the gun off to tussle, and suddenly a frantic woman, laura black, (emily mortimer), bursts in. we were with her driving outside, just a few moments ago, as she side swiped a car. Now, she is freaking out about not being able to get her medication, and is lost and soaked, and an absolute mess. the gun situation leads to another problem because mike has very little money. he needs to get the window replaced, only if he spends his money on that, then he and his wife can’t make the next month’s rent. so mike goes to see a bar owner named bruno (rodrigo santoro), to ask for a loan. this man is sonja’s brother, and mike’s brother-in-law. mike goes there to ask for the loan, only before he gets to bruno, he learns that joe quit his side job of working for the bar, because bruno wasn’t paying him. Mike is the one who set joe up with bruno, and got him the job, and so mike is offended that joe wasn’t being paid. when he sees bruno, instead of asking for a loan, the first thing mike wants to know is why bruno wasn’t paying joe. in this way, mike shows honor and nobility by asking for his friend before he asks for himself. then a fight breaks out in the bar, mike gets involved, and he never gets the chance to ask bruno for that loan. the fight is with a well-known action movie star, named chet frank (tim allen), who came to the bar just to sit down for a drink, and ends up getting beaten by another guy there. that guy is offended by a comment of chet’s, and the fight breaks out because of it. mike gets involved and has to put down a whole group of guys who come after him. by the end of the bar fight, mike has saved the day, but has gotten no prize to show for it. no money, no reward, no asking for a loan. he’s walking out of that bar the same way he came in, a man with lots of honor, but very little money. this is the end of the first act. mike has a money problem and two big events have taken place which will put the rest of the movie in motion. the first event was the breaking of the window, and the second was the bar fight. mike finds himself being invited into a new world by chet frank, who is grateful for mike saving him. that world is the one of movies and sets and scripts. mike is brought onto the set of chet’s new film, as a consultant on the script. then they want to make him a producer. things start to get really interesting when a stolen watch ends up being given as a present and then getting joe into some hot water. the watch comes from chet frank and his manager, jerry weiss (mamet regular, joe montegna.) meanwhile, mike’s wife borrows a lot of money from a loan shark in order to order some dresses that chet’s wife wants, and suddenly finds that chet’s wife has had her phone numbers disconnected and has basically disappeared. this movie, like the spanish prisoner or any other conspiracy movie, going all the way back to north by northwest, plays the angle of people suddenly not being what they seemed. the phone numbers getting diconnected is that classic moment of what appeared one way yesterday is no longer like that today. it’s the north by northwest scene of carey grant returning to the house where he was kidnapped to find the place totally different. mamet used this same kind of structure in the spanish prisoner as well. but there’s more than just a stolen watch at play here. mike finds out that his training ideas have been stolen by a fight promoter (ricky jay, another mamet regular), who might have ties to the movie people. these are the seddy characters who you can’t trust, and suddenly blackmail and the gunshot scene from the beginning gets brought back into the mix. there are lots of surprises and twists and angles here, and david mamet handles them all, just right. for example, when mike gets sold out by someone and doesn’t know who, i kind of like that the movie doens’t push that mystery on us. it doesn’t turn this into a film about who sold him out, and when we do find out later on, it’s like a bonus surprise instead of the thing we were waiting for. 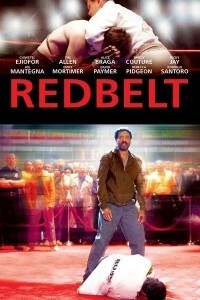 red belt is filled with david mamet’s classic way of writing dialogue. like tarantino, this guy’s writing style is totally unique, and for mamet, it’s having his characters repeat phrases. sometimes it’s their own phrases, (“Baby, let the wheel come around. Just let it come around.Sometimes you can just let the wheel come around.”) other times it’s ones that someone have just said to them, that they are now repeating as a question, such as “joe, the cop.” then “Joe, the cop?” or “the wind blew something in through the window,” then “the wind blew something in through the window?” but the dialogue is just the start of why this movie is great. the story is what really makes the film. there are mysteries that we don’t even realize are mysteries until we are caught right in the middle of them. this could have been a movie about who sold mike out, with each character who was in the opening scene being a suspect. snow flake, joe, sonja terry, and ms. black. only, instead of falling into a cliched mold of a structure, like that, mamet keeps his ideas fresh. however you think this movie will go, it ends up going a different way. will mike end up fighting in the ring at the end for the big fight? Can this woman who just conveniently strolled into his dojo be trusted? these are questions that most movies would have you asking. in Redbelt, mamet doesnt’t even bother. he side-steps the usual surprises or reveals for unique ones of his own.